Succession planning – what is it and why do we need to think about it? In business, there comes a time when you leave, retire or sell the business. A succession plan is your and your business’ plan for you or other staff members exiting the business. Why is a succession plan valuable? Having a succession plan is beneficial now and in the future. Like any plan, it includes milestones to ensure the plan is on track. It creates certainty and adds value to the business. At the time of departure, the plan ensures a smooth handover or transition. A succession plan is the best way to make sure your business succeeds beyond you or other key staff. It’s relevant for small businesses, family businesses and larger organisations. A realistic succession plan means there are procedures in place to manage change when it occurs. Start your succession planning by focusing on the most senior person in the business. That’s the manager, executive director and key position holders. Which roles are important to business operations? Which roles will be hard to replace? A succession plan develops existing employees to fill specific positions. Your plan needs to include external recruitment to attract skills and people for various roles. What does not having a Succession Plan mean? The absence of a succession plan can undermine a business’ effectiveness and sustainability. Without a succession planning process a business may miss or fall behind in providing the services of the business. A succession plan is a business’ commitment to providing services, even during a transition. It is advisable to discuss your succession plan with your business adviser, accountant or lawyer. Remember to revisit, relook and reconsider the succession plan, regularly. There are templates and guidelines available online. If you have questions contact, CVW Accounting on 9219 1300. 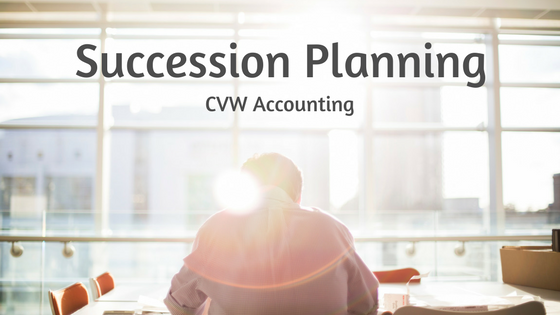 This entry was posted in Advice, Succession Planning	and tagged #planning, business advice .